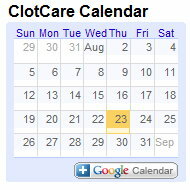 ClotCare: Is Warfarin-Induced Bleeding Increasing? Review: Kucher N, Castellanos LR, Quiroz R, Koo S, Fanikos J, Goldhaber SZ. Time trends in warfarin-associated hemorrhage. Am J Cardiol. 2004 Aug 1;94(3):403-6. Investigators from Brigham and Women's Hospital in Boston recently reported that they found that major bleeding (including intracranial hemorrhage - ICH) with warfarin increased during 1998 to 2001 when compared to an earlier period of 1995-1998. Specifically, major bleeding increased from 20.2% of admissions to 33.3%, and ICH increased from 1.9% to 7.8%. Particularly interesting was the fact that anticoagulation intensity was not different during the two periods, and the median INR associated with major bleeding was only moderately prolonged above the target range. The authors attributed the increase in bleeding primarily to the increased use of combination anticoagulation therapy and/or the use of medications that potentiate the effect of warfarin. While their data support their conclusions, further scrutiny suggests additional possible causes for a higher bleeding rate in the more recent period. Hypertension, which increases the risk of bleeding, was present in more patients in the more recent period. Additionally, there were significantly more patients in the more recent period who had a prior ischemic stroke (34 vs. 12) and more were receiving warfarin for secondary prevention of stroke (22 in more recent period vs. 7 in earlier period). The SPIRIT1 compared warfarin (INR target of 3 - 4.5) with aspirin for secondary stroke prevention. This randomized trial in 1,316 patients was stopped early because of an unacceptably high bleeding rate (including 27 intracranial hemorrhages - ICH) among the group randomized to receiving warfarin. A diagnosis of cerebral vascular disease has long been recognized as a risk factor for bleeding in anticoagulated patients and some have thought that the increased risk of ICH might be due to pre-existing intracranial vascular disease or damage. More recently, the SPIRIT investigators and the SPAF (stroke prevention in atrial fibrillation) have found that perivascular disease visible on MRI is associated with an increased risk of ICH (personal communication). While the data from the group at the Brigham and Women's Hospital should increase our caution in using combination antithrombotic therapy, their data also suggest that caution should be used when anticoagulating patients for secondary prophylaxis of stroke. Finally, although it is not clear from the data reported in this article, one must question whether the commonly used combination of aspirin and clopidogrel may have added to the increased bleeding risk in the latter period in view of the recently reported MATCH study results, which you can review at http://www.clotcare.com/clotcare/aspirinandclopidogrel.aspx. 1. Stroke Prevention in Reversible Ischemia Trial. A randomized trial of anticoagulants versus aspirin after cerebral ischemia of presumed arterial origin. Annals of Neurology 1997; 42:857-865.